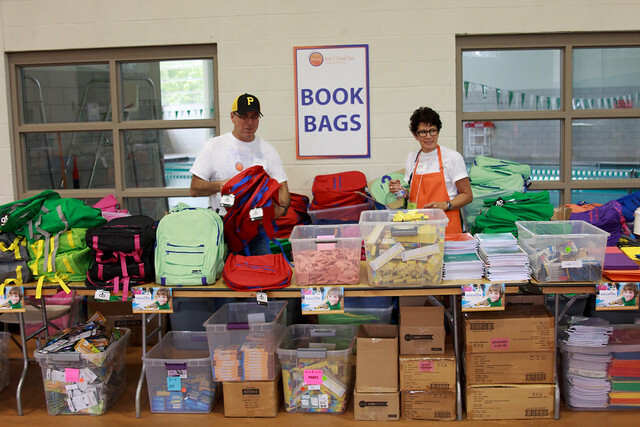 The third Back 2 School Store in Pittsburgh was another success! We were able to serve more than 550 children on the day of the event and provide surplus supplies to even more students through local organizations. Nearly 400 volunteers came together to provide these children and families with valuable resources and the back-to-school experience every child deserves. Children were sent to the Back 2 School Store from several local organizations, including: ACH Clear Pathways, Allegheny County Department of Human Services, Allegheny Intermediate Unit, Best of the Batch Foundation, Bhutanese Community Association of Pittsburgh, Circles of Greater Pittsburgh — East Liberty, East End Cooperative Ministry, Homewood Children’s Village, Hosanna House, Jewish Family & Children’s Services, Kingsley Association, Northern Area Boys & Girls Club, Northside Common Ministries Community Food Pantry, Pittsburgh Public Schools, Sojourner House, Squirrel Hill Community Food Pantry, VA Pittsburgh, and the Women’s Center & Shelter of Greater Pittsburgh. This event would not have been possible without the generous support of our corporate, foundation, and in-kind sponsors. Thank you to 412 Food Rescue, Allegheny County District Attorney Stephen A. Zappala, Jr., big Burrito Restaurant Group, Eat ‘n Park, The Education Partnership, Food for Thought Deli, Fox Rothschild LLP, Giant Eagle, The Grable Foundation, Perspectives Inprint and Debbie Levy Green, Huntington Bank, J. Marcus Wholesalers, Inc. and Sydney Love, The Jack Buncher Foundation, The Kingsley Association, Little’s Shoes, Murray Avenue Kosher, NuGo Nutrition, Jack Pechersky, DMD/Aaron Valasek, DMD/David Pechersky, DMD, The Philip Chosky Charitable & Educational Foundation, Pittsburgh Firefighters IAFF Local No. 1, Pittsburgh Oral Surgery, Rodef Shalom Congregation, and Zoom Dry Cleaners. We also want to recognize the volunteers who spent months planning and organizing this event. Thank you to Back 2 School Store Co-Chairs Elyse Eichner and Lynn Farber; Community Service Chair Jenny Jones; Committee chairs Stephanie Broff, Kristen Keller, Barbara Parker, Becca Tobe, Lynette Lederman, Susan Jordan, Elaine Beck, Dodie Roskies, and Eve Skirboll; and steering committee members Dave Bender, Susan Berger, Judy Bernstein, Tanya Bielski Braham, Laura Broff, Susan Denmark, Amy Dicker, Pam Eichenbaum, Jennifer Finkelstein, Cathy Gold, Lissa Guttman, Mara Hellman, Sandy Hirsch, Teddi Horvitz, Becca Hurowitz, Kathy Klein, Natalie Klein, Myrna Kline, Elaine Krasik, Donna Kruman, Meredith Levy, Katie Peterson, Sally Rock, Sandy Rosen, Susan Rosenblatt, Barb Siegel, Lynne Siegel, Lynn Snyderman, Hilary Spatz, Robbin Steif, and Suzanne Wagner. You exemplify what makes NCJW Pittsburgh an incredible organization.